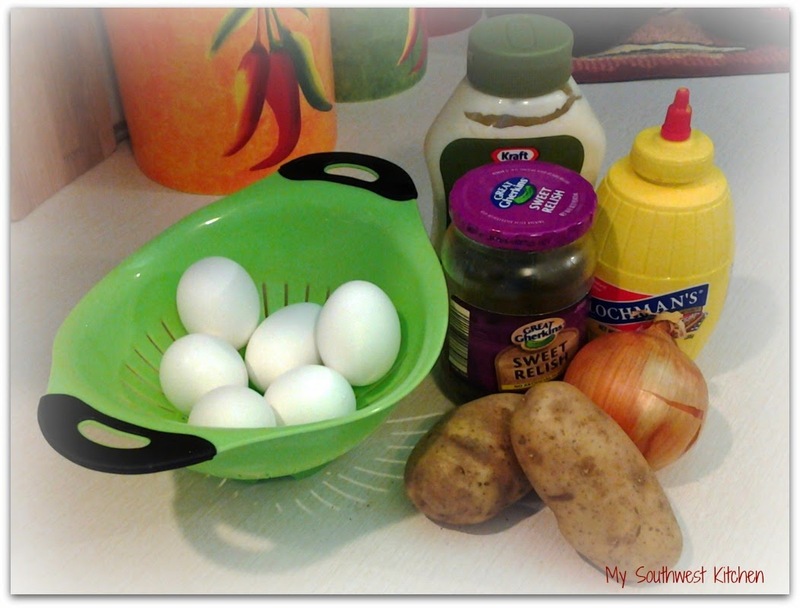 In honor of Mother's Day yesterday, I am going to give you my recipe for potato salad. Every time I make it, I get high compliments and am requested to make it again. This is one of the few recipes I learned from my mother. She cooked a lot while we were young, but as we got older and she worked away from home full time, she didn't cook as much. She never really "taught" me how to cook, I just sort of taught myself by reading recipes and watching others. And, through the years I developed my cooking skills while watching Food Network and other cooking channels. I get a lot of my inspiration from cooking shows and Pinterest. Cooking has come naturally to me, just one of those talents people are blessed with and I really enjoy it when I have the time to devote to it. Boil the potatoes, whole with skin on. Boil them until they are fork tender. Drain and let cool enough to handle them. At the same time, boil your eggs. 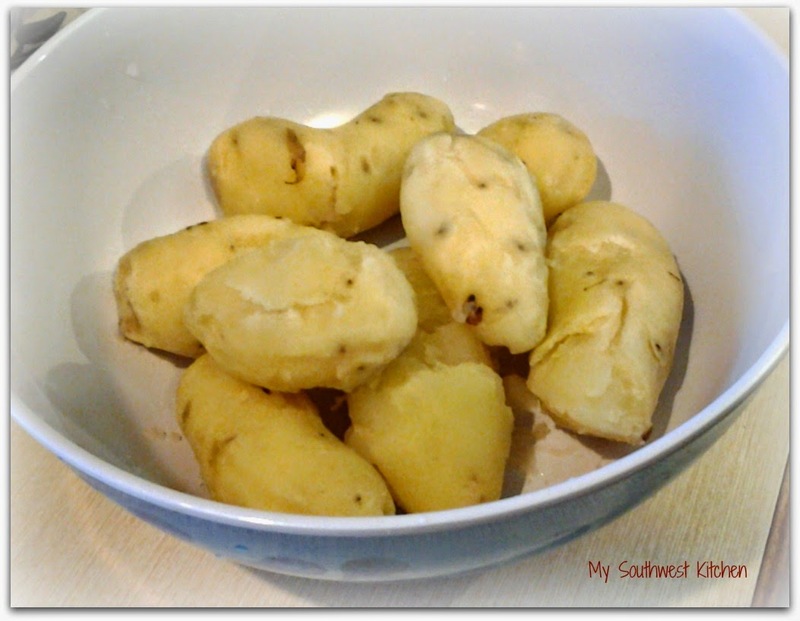 Once the potatoes are cool enough to handle, peel them using a small knife or your fingers. The skin comes off pretty easily once they are cool. Dice up all the potatoes and eggs into a large bowl. Add the diced onion, mayonnaise, mustard, relish and salt and pepper. Stir everything together and chill for an hour or two to allow the flavors to mingle. You may need to add more salt before you serve, potatoes soak up salt. You can garnish the dish with some paprika if you are feeling festive. And there you have it, Mom's Potato Salad. Make lots if you are feeding a big crowd, it will go fast. I hope you enjoy it as much as my family does. And, Happy Mother's Day to all the moms, step-moms, grandmas and single dads out there! Who's ready for spring? I don't know about you, but I am way past being ready for spring. The weather needs to warm up and quickly! The forecast for the beginning of next week is saying 70 degrees, I sure hope they are right! Okay enough about the weather. On to cooking. This is another one of my signature dishes. It is requested fairly often by my family. It is quick, and easy. Oh, and it taste fabulous. In a skillet add the chicken, tomato sauce and chile powder or enchilada sauce packet. Stir together and warm over low heat. Take about 8 to 10 tortillas and warm them slightly in the microwave, just long enough to make them pliable. Divide the chicken between all the tortillas. It takes about a heaping 1/2 cup or so for each tortilla. I just fill and roll until I have used all the chicken filling. Place the rolled enchiladas into a greased 9 x 13 inch pan, seams down. They usually fit perfect in rows vertically. For the sauce, place the cream of chicken soup, one can of milk, the sour cream and green chiles in a bowl. Stir together until smooth. Heat in the microwave for 1 minute. Pour over the rolled enchiladas, making sure you cover all of them. I press down a little with the spoon to get it into the nooks and crannies. 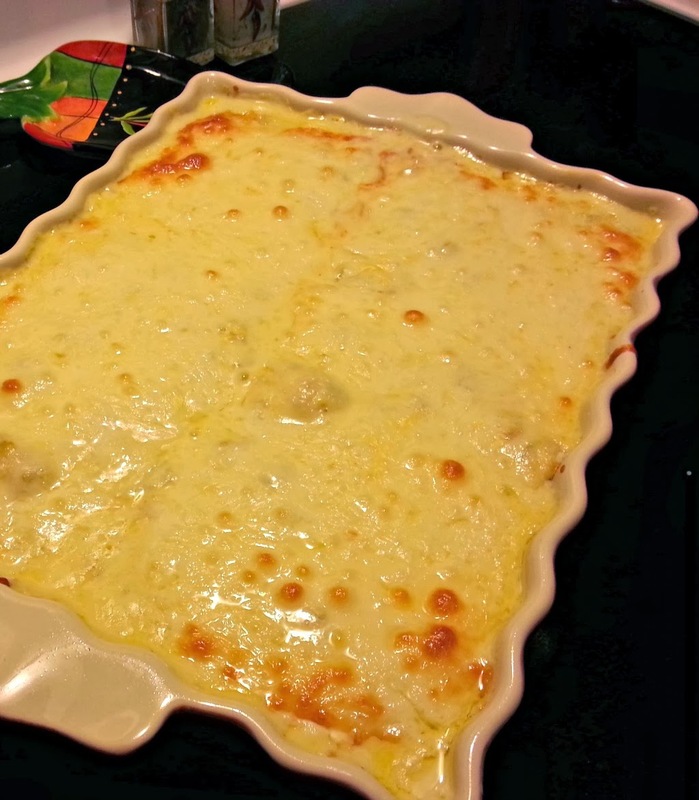 Sprinkle the shredded cheese over the sauce and bake at 350 degrees until the cheese is melted and bubbly, about 30 minutes. Let sit for a few minutes before serving to allow them to set up. Garnish with more sour cream, sliced black olives, guacamole or any other toppings you like. They are perfectly fine without all the toppings too. And that is it, easy peasy! I hope you enjoy this dish as much as we do. Happy Spring! I do believe I am over winter this year. Spring cannot get here fast enough for me. But, since we still have to deal with the cold weather and snow, I thought I would post a recipe for something yummy to warm you up. I found this recipe on Pinterest last year and it is so good. I don't know about you, but I consider Mexican food, comfort food and this is perfect for these cold, cold days. So here is the recipe. Preheat oven to 400 degrees. In a large bowl, combine the first 7 ingredients (milk through the green chiles), using just 1/2 tablespoon of the taco seasoning. Stir this just until moist. Pour mixture into a round pie plate coated with cooking spray. Bake at 400 degrees for 20-30 minutes. While the corn is baking, toss the chicken in the remaining 1 tablespoon of taco seasoning. Once the corn is done, (it will be just barely set and golden brown), pierce the entire surface liberally with a fork. Pour the enchilada sauce over the baked corn bread. Top that with the chicken and sprinkle the cheese over the top of that. Bake at 400 degrees for 15 minutes or until cheese is bubbly and melts. Remove from oven and let stand for 5 minutes before serving. 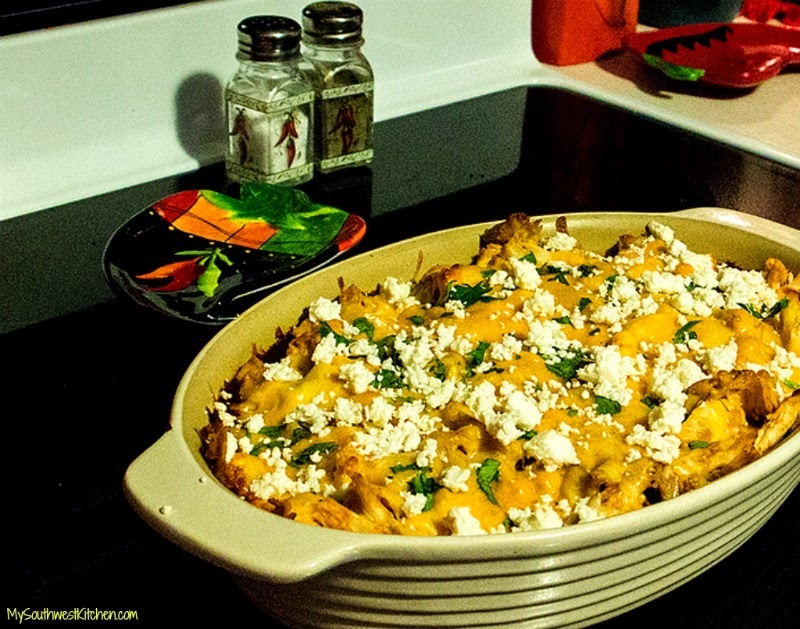 Top each serving with cilantro and Cojita cheese. I also like to add some sour cream, but this is optional. 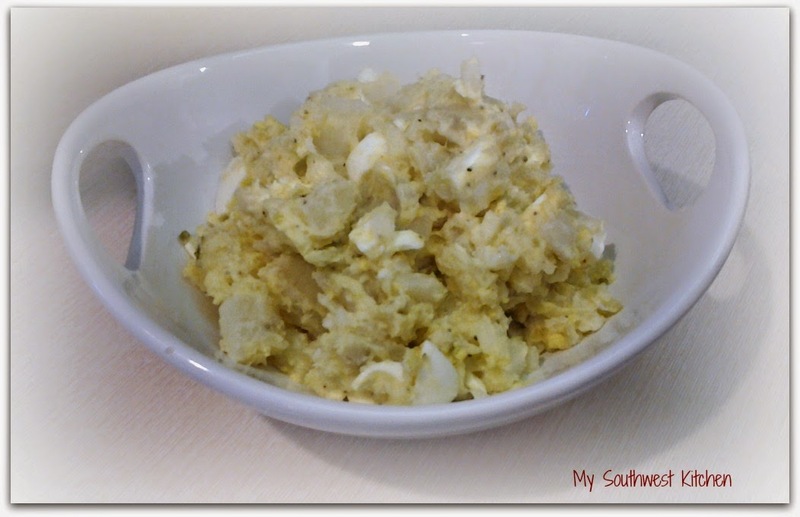 This is an easy dish to prepare and is so yummy. Enjoy! Do you love the taste of the ground beef in the tacos and burritos at your favorite Mexican food restaurant? Here is a method to make it at home for when you just are not in the mood for going out. Place the raw ground beef in a large skillet or sauce pan. Cover with water and add seasonings. Bring the meat to a boil, and then turn down to a simmer over medium low heat. Cover and simmer for one hour. Break up the ground beef as it simmers and add water when needed. After it simmers for an hour, add the finely diced onion and let simmer for another hour. Now you have that perfect taco meat that can be used for all kinds of dishes. I would use it in enchiladas, burritos and of course tacos. You can make large batches of this and freeze it for an easy and quick mid week meal. Enjoy! I've always loved cooking for my family & friends. They suggested I start a blog to share my talent for creating delicious dishes. 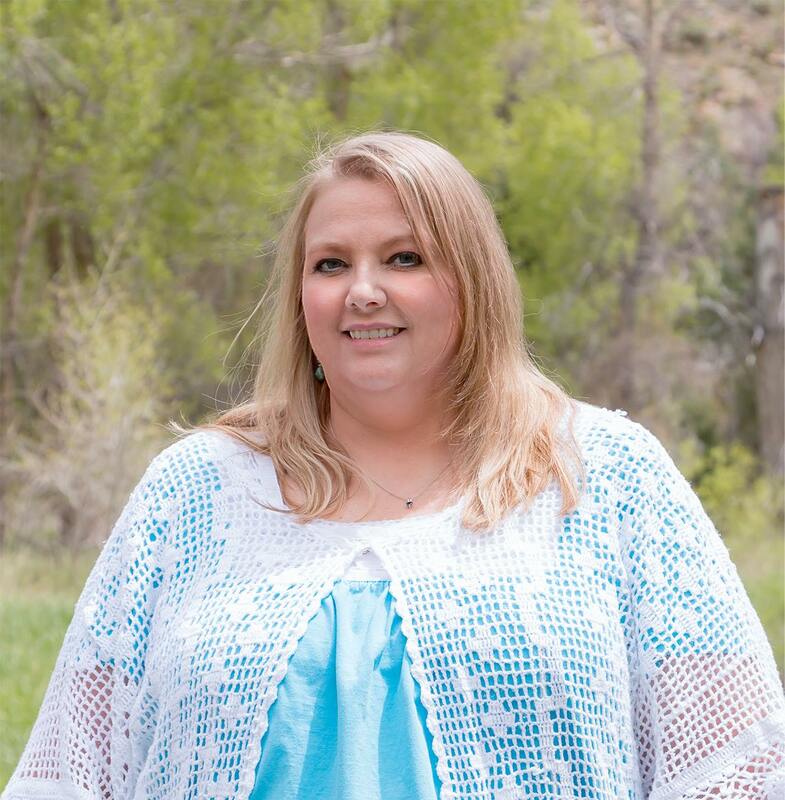 My Southwest Kitchen will cover my love of southwest & hispanic recipes and many others for you to enjoy. Please leave a comment if you try one of my recipes or have suggestions for new dishes.